In all the talk about pallet jack safety, electric pallet jacks sometimes get lost in the shuffle. Electric pallet jacks are used mainly in warehouses and other places that require pallet transportation. However, unlike forklifts, they don’t do any real lifting. Instead, they only elevate the pallets enough to clear the ground. Pallet jacks look safe. But as with any piece of industrial equipment, they come with certain hazards – including accidents. So it’s essential to understand the need for electric pallet jack safety training. As you’ll see, pallet jack safety practices are mostly common sense. But they’re still relevant, especially when it comes to preventing accidents. Pallet jacks don’t look anything like a forklift. OSHA puts them in the same category of “powered industrial truck.” That’s where the similarities end. Perhaps the most significant difference between the two is how they move cargo. Forklifts hoist pallets and other cargo onto warehouse shelves. Pallet jacks only lift pallets a few inches off the ground. – Operator area/cabin. Located at the front of a pallet jack, this is where the operator stands and controls the equipment. – Forks. These extend backward from the operator area. Most pallet jacks have two forks that lift pallets off the floor. Designed to lift pallets high enough for ground clearance only, pallet jacks are simple to operate. First, the operator secures a pallet on the forks. Then embedded wheels lift the forks up a few inches, allowing the pallet jack to move. In warehouses, pallet jacks are the truck of choice for “order picking.” This is the process of placing items on a pallet jack to fill customer orders. Once an order is complete, the operator usually wraps the pallets in clear plastic. This prevents items from falling off. Then, the pallets are dropped off in a truck or placed near a dock. Here’s why pallet jack safety is necessary: because it runs on its own power. Anything that moves under its own power can cause an accident. Let’s look at some different aspects of pallet jack safety training, including examples of different hazards. Then we’ll talk about how CertifyMe can help with your electric pallet jack safety training needs. 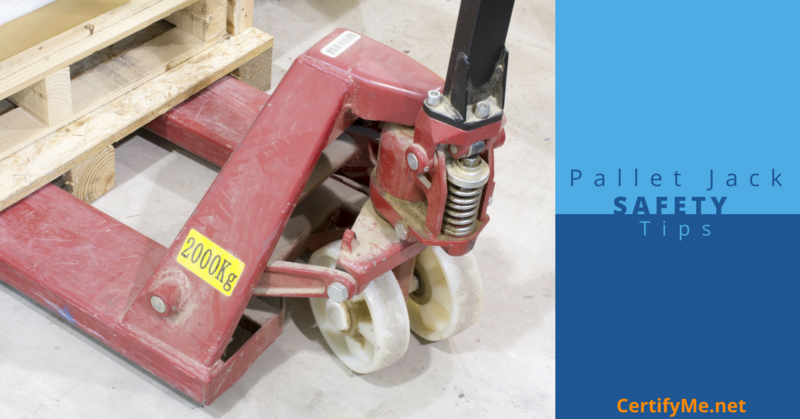 Pallet jack accidents can also occur when the pallet jack isn’t properly maintained or needs repairs. Worksite hazards can include other workers and equipment, as well as dirt or grease on the floors. According to OSHA pallet jack safety specialists, pallet jack injuries can be more serious than you might expect. In one accident, a worker was fatally crushed by a falling load. He left the operator area and walked behind the pallet jack to check on the load. It’s not known if the load was stabilized properly. Another worker had four toes on his left foot amputated due to a pallet jack accident. He inadvertently dropped the pallet and backed away directly into the path of an oncoming forklift. The forklift ran over the worker’s foot, crushing his toes. Other pallet jack workers have suffered crushed legs and bones broken. Many have been pinned between pallet jacks and other objects. Without proper safety training, workers may not know how to avoid common pallet jack hazards. Too often, the result is a serious injury. Don’t overload the machine. Mega-loads on pallet jacks are not safe under any circumstances. Always check your pallet jack’s load limits before using. If you can’t find the information, check with your safety supervisor. Ensure the cargo is secure. This includes the pallets and all items on them. Misalignment of the pallets on the jack’s forks can result in a damaged pallet and an accident. If you hear cracking or splintering sounds when engaging a pallet, check to see if the forks are aligned correctly. Then check the pallet for damage. Watch your speed. Electric pallet jacks have a turtle-like top speed of about four miles per hour. Yet, that is plenty fast enough to cause an accident, especially when carrying a 4,000 lb. load. Pay attention to warehouse entries and exits. Some warehouses have large plastic “flaps” for doors. Use caution when approaching. New drivers, not familiar with traffic flow, could accidentally exit or enter. Also, pay attention around corners. Approaching a corner too fast is an accident waiting to happen. Keep your pallet jack well maintained. Electric pallet jacks require regular battery charges and checkups. Otherwise, safety and performance could be compromised. In addition to the safety tips described above, workers can take other steps to prevent pallet jack accidents. With OSHA fines for unsafe work practices in the tens of thousands of dollars, you can’t afford a failed audit or workplace accident. For the best safety training around, CertifyMe.net has everything you’re looking for. We offer outstanding training modules for all skill levels, from beginners to experts. For only $299 you can make your workplace safe and more efficient. Workers can complete their pallet jack safety training and receive their forklift certification from anywhere they have Internet access. And they can do it for about an hour. You can also certify your workers on warehouse forklifts (Classes 1, 4, 5) and Class 7 rough terrain forklifts. The CertifyMe pricing page has additional info about training programs, costs and more. We offer lifetime support and free 3-year renewal training. Contact CertifyMe at 1-888-699-4800 today! This post was originally published in 2015 and updated in 2019 to provide additional pallet jack safety training information.